FROM THE ROCKIES?? YOU ASK . 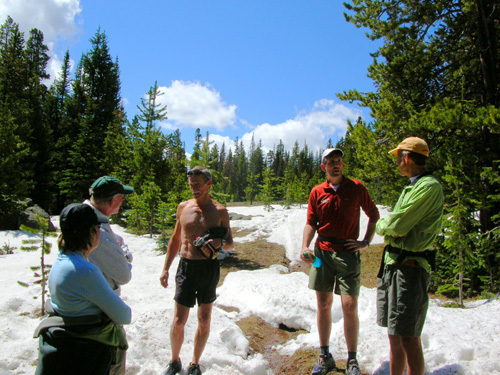 . .
we enjoy the beautiful mountains or the people involved, nothing like that :-) Let us know." If you knew how many times Jim and I have changed our minds about this year's running and traveling plans, you'd think we were totally incapable of making any decisions!! We have never agonized over a summer escape like we have this year. After much debate and angst, Jim sent Lois another letter a few days later to tell her we had finally decided that no, we wouldn't be going out there this summer. 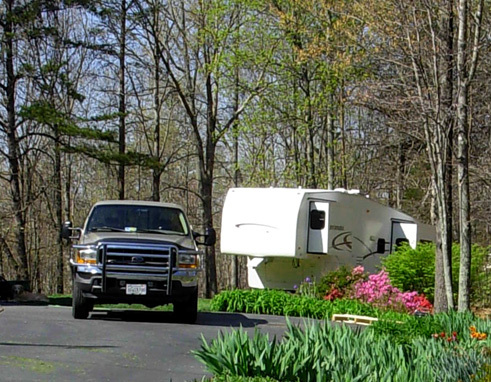 Like many folks around the country who are blown away by the astronomical increase in the price of gas and diesel this year, as well as food and just about every OTHER consumer product and service, we're choosing to stay closer to home this summer. There's even a new word for the phenomenon: having a "staycation" instead of a "vacation!" The "HitchHiker Hilton" is dry-docked for a while in our back yard . . . So if you're been wondering why I haven't been waxing poetic in this journal about our fourth annual summer trip to the mountains of Colorado and Wyoming, that's why. It's amazing how much cheaper it was for us to travel three times between Virginia and Montana, California, and Colorado in 2004. TWO trips out West last year were still reasonable because of our inexpensive camping fees, but we simply can't justify the expense of two more odysseys this year. That's how bad the fuel costs have gotten. After considerable discussion, we decided one trip is more fiscally responsible for us this year, and our preference is to do another winter "sunbird" trip rather than our favorite summer trip. The decision still has us bummed out, I must admit -- especially since it started getting more hot and humid in Roanoke recently! We will definitely miss those daytime temperatures in the 60s in the mountains (not so much the 30s and 40s at night, though). Unfortunately, what we would have spent on a summer trip may end up going toward the purchase of a new heat pump at home so we can stay comfortable in the heat and humidity. Our 19-year-old house is beginning to need some expensive new parts. (Sorta like this 59-year-old runner!) I joked to Jim that it would have been cheaper to go out West all summer. Obviously, that doesn't solve our HVAC problem in the long run. A quick scan of the 2008 topics page would indicate that I haven't written in this journal for over three months -- since we returned back home to Virginia from the Southwest. Not so. I only recently uploaded the final entries for that trip. It wasn't total procrastination on my part, just being busy with other aspects of our life. In addition, writing the journal in retrospect is tougher than in "real" time, and I have a total inability to be BRIEF, as you've noticed. I decided to wait to announce our running and traveling plans until uploading all the Southwest entries. It's just as well, because each entry would have contradicted the last. And the plans we mention now may change, too. Keep in mind what I've told you before: we are flexible, not indecisive!!! Soon after we got home in early February, Jim decided to take an "enhanced" EMT class lasting until June 12. He'd already signed up for the Bighorn 100 on June 20. Hmm . . . not much time to get acclimated like we've done before! He figured he knows the course, it isn't all THAT high up, and maybe he could skip the last few classes where the students practice scenarios (after the book-learning is over) and wait to take the test in September. Not the ideal plan, but do-able. Turns out that the class has been pretty demanding, requiring so much time and study that half the students dropped out by the second month. Good thing Jim's retired and highly motivated to learn. Besides the class and driving time, he had to spend considerable time checking off a list of tasks in the hospital ER and back of the ambulance -- things like giving injections and hooking up IVs ("sticks"), giving meds under supervision, and helping with intubations. In addition, Jim runs as many calls with the rescue squad and fire department as he can, all as a volunteer (read: without pay). Those calls usually take at least two hours each, day or night. All this "running" takes a lot out of him but he enjoys it, especially the EMT calls. This has played serious havoc with his OTHER running. If he's out half the night on rescue calls, or totally absorbed with his class work, he is too tired to train properly for the ultras he entered. Add to that the uncertainty (until late April) about our summer trip, and he eventually lost the motivation to train hard, also. He ran two of David Horton's ultras nearby (Holiday Lake 50K in February and Promise Land 50K in April) but cancelled plans to run Land Between the Lakes 60K in Kentucky in March (snow that would have made driving dangerous to get there) and Umstead 100 in April (inadequate training for the distance). And of course Jim has other responsibilities around the house and yard that consume a lot of time -- routine maintenance, various repairs and new projects, mowing, fertilizing, spraying fruit trees, cutting wood, etc. Then there is vehicle maintenance. The list is never-ending, as anyone with a house, yard, or vehicle knows. All this has helped to drain his time and energy since we returned home four months ago. 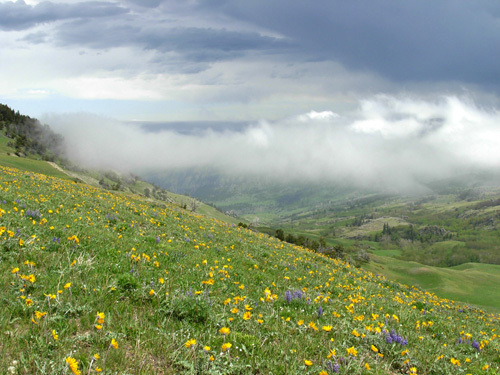 During April we were still uncertain about going out to Bighorn. To get a partial refund, Jim had to let race management know he was withdrawing by May 1. And that's about when he let them know for certain that we wouldn't be coming. Not only were fuel prices increasing on a daily basis, he also didn't have the training base he needed to finish the race. 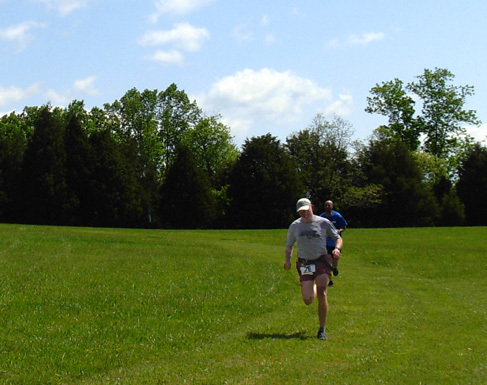 Entries were still open for the 100-miler during May, but we didn't change our minds again! One benefit of not rushing out to Wyoming this week for the Bighorn race is that Jim's able to complete his EMT course and take the test in a few days while the information is still fresh in his mind. Then he'll have more time to train for other ultras later in the year. We still didn't know at the time we made our final decision about the trip to Wyoming and Colorado if the Hardrock race was a "go" in mid-July. The snow pack this year has been as high or higher than one of the years in the past when they cancelled the race. It was announced in late May that the snow was melting fast enough that it's pretty certain the race will be run. That's great! Unfortunately, we won't be there this time to work the Cunningham aid station and visit with our friends for several weeks. That, as much as the running itself, is what keeps us involved in ultras -- the people. We've never been home much (or any) during the summer since we moved to Virginia in the spring of 2004. I'm happy to be able to grow a veggie garden this year and enjoy all the beautiful perennial flowers the former owners so painstakingly planted and tended. They've probably had a few near-heart attacks when they've driven by to see "their" flowers the last few summers when we've been gone and the weeds have taken over! We have a neighbor cut the grass, but he isn't able to keep up with the weeds, too. It will be nice to keep the weeds under control. It's always been such a major chore to clean up the garden areas after being gone all summer. Since we got back in February I've spent many (mostly) pleasant hours working in the yard. 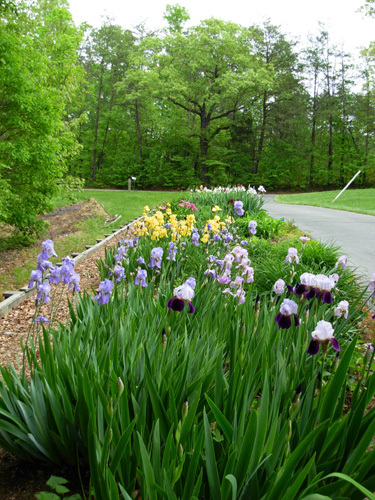 We "inherited" what I estimate to be about 400 square yards (nearly one-tenth of an acre) of perennial flower and shrub beds along the driveway and surrounding the house. 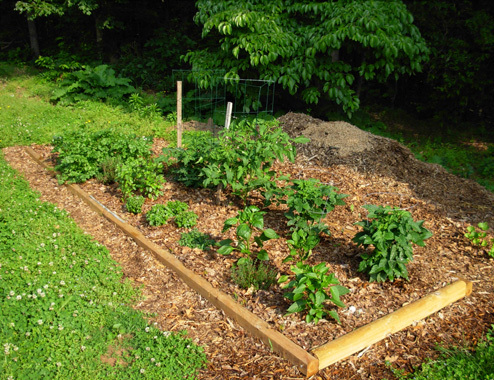 That doesn't sound like a lot until you water, fertilize, weed, mulch, dig, plant, divide, dead-head, prune, and propagate that much territory -- and try to protect it from decimation by insects, moles, rabbits, and deer! We also have about 3/4 acre of grass to mow and eleven acres of hardwood trees that require some maintenance. Despite the work I knew would be involved, the gardens were one of the reasons I fell in love with this house when we first saw it on a fine spring morning. 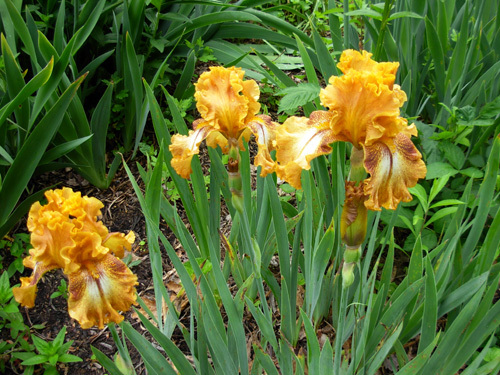 Gardening is in my blood, almost as much of a passion as running, photography, and writing. I love to play in the dirt, even when it includes spending several hours a week pulling weeds. 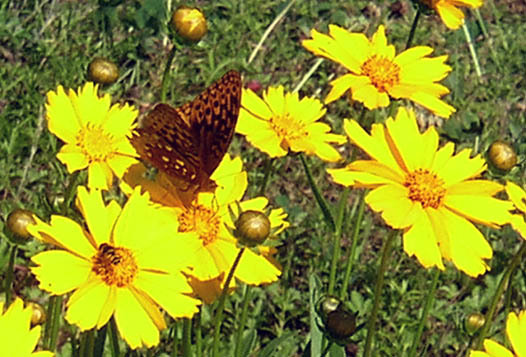 It's good exercise and I like the results -- lots of flowers, butterflies, and birds. What hasn't been any fun is what I call "The AEP Mess." I talked about it in one of the entries last fall. 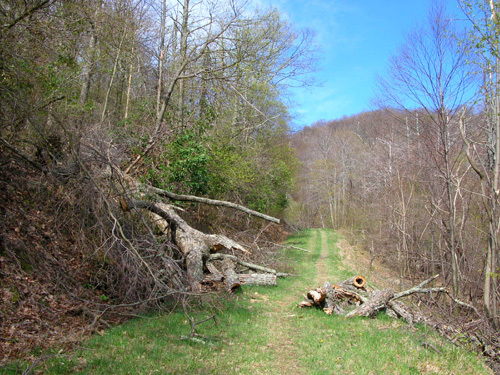 We were left with two large areas of felled trees, big limbs, and smaller branches under our power lines. Although we haven't finished cleaning them up, we're ahead of some of our neighbors. It's very hard, time-consuming work for us to cull out the good fire wood, cut it up, haul it to the woodpile, and stack it to dry. Jim mans the chainsaw and we both haul and stack the wood Then I can gather up the smaller limbs and branches into piles to burn in the natural area -- with water hoses on standby. 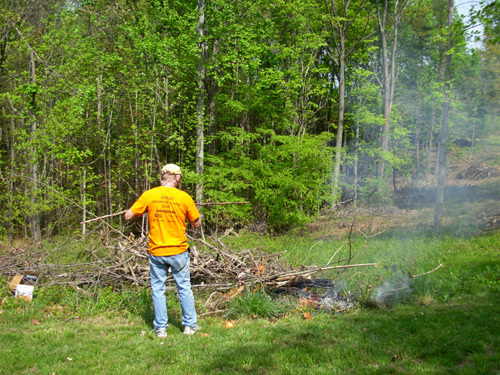 We've burned two piles of branches (above) but have several more piles to burn -- and collect -- before we're done. Jim will probably need to borrow a brush truck from the fire department for the piles farthest from the house because our water hoses won't reach that far. We'll get to that task when he's done with his EMT class. After recently seeing either a copperhead or timber rattlesnake (both are poisonous) in the brush where I was clearing limbs, and several three- to four-foot non-poisonous black snakes along our road when I'm out for walks, I'm real hesitant to get back in the increasingly taller weeds under the power lines to pull more limbs into piles!! That job will have to wait until next winter when the weeds die down again and the snakes go back into their holes. I'm guessing there are some snakes and babies that just love those piles and have made them their homes for the summer. Maybe we'll have some roasted rattlesnake meat when we burn the brush piles . . . I'm also getting paranoid about pulling weeds and doing other tasks in the garden areas now that they are more lush and I can't see the ground. In May a woman in our area died two days after apparently getting bitten by a snake in her garden. She didn't see a snake, but told her husband it felt like something bit her on one of her fingers. She collapsed before she could even reach her house. Doctors think she had a severe allergic reaction to a poisonous snake bite. They couldn't save her. Stories like that get my attention!! This is the first year we and our neighbors have seen so many snakes in our neighborhood. The more folks I talk with on my walks, the more copperhead and rattlesnake stories I hear. Add to that our still-vivid memories of Jim's rattlesnake bite two years ago on the Bighorn course and, well, let's just say we're REAL CAUTIOUS out in the yard and running on trails right now! We have other more interesting critters in our yard and woods, fortunately, and I love to see and/or hear them -- deer, wild turkeys, turtles, squirrels, rabbits, frogs, and numerous birds and butterflies are our most common visitors. Our hummingbird feeder stays busy and I've been hearing the turkeys gobbling in the woods lately. The turkey babies ("poults") are very cute. Besides many hours working in the yard and gardens, I also have plenty of other things to do to keep our lives running smoothly. Fortunately, this has been a long, planned "rest period" for me running-wise. Soon it'll be time to get geared up for some fall ultras, however. Jim's running goals back in February were very different from mine. After Rocky Raccoon, he planned to use several 50K to 50-mile races as training runs for the Bighorn 100 in June, then rest and enjoy running in the Rockies all summer. As mentioned above, other priorities sabotaged his original race plans and the only ultras he ended up running were Holiday Lake (about 32 miles) in February and Promise Land (about 34 miles) in April. Jim heads toward the Sunset Fields aid station during the Promise Land 50K in April. It was too hard for Jim to train properly for either Umstead or Bighorn. After he withdrew from those races, he cut back even more on his training miles in May, dropped his YMCA membership, and focused on all the other things that required his attention. The rest from running as many miles for several weeks will probably serve him well when he regroups later in June. I felt so good after ATY that I continued running 25-35 miles a week while we had access to those wonderful trails at McDowell Mountain Park near Phoenix, but I reduced them significantly after leaving Arizona in January. My weekly average from January 1st until now is just 25 miles (ranging from 16 to 36 miles per week), compared to an average all last year of 35� miles a week. My longest runs since the beginning of the year have been a couple of 15-milers. Jim's done more weekly mileage than I have, but also quite a bit less than last year. He's running a combination of hills for strength and flatter terrain for speed. I've had to reduce the hilly miles to save my knees (minimal cartilage). They don't hurt at all on flat or undulating terrain. I do feel one of them (not the one that had the MRI last fall, oddly enough) going down a hill if it's too steep, and occasionally going down stairs if I'm tired or carrying something heavy. It's been an interesting process to relearn how to run hills. Instead of running down and walking up, it's better now for me to run up and walk down. Both of us have the goal of regaining some of our speed this year so we don't have as much pressure to make cut-offs in ultras. We've been devoting one or two workouts a week to various types of speed work like fartlek, repeats, and tempo runs. Our favorite venue is the crushed-rock surface on the Wolf Creek Greenway in Vinton (eastern suburb of Roanoke) where we did most of our training for ATY last year. 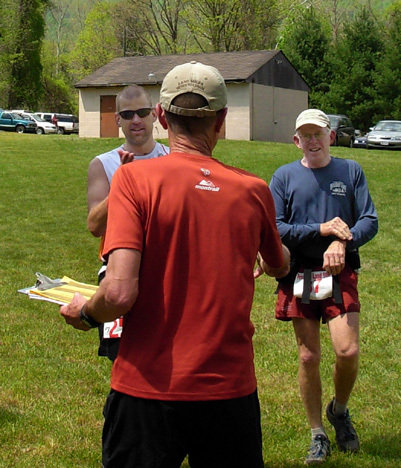 Jim has also entered five or six local road and trail races from 5K to the half-marathon distance to force himself to run faster than he would in training. 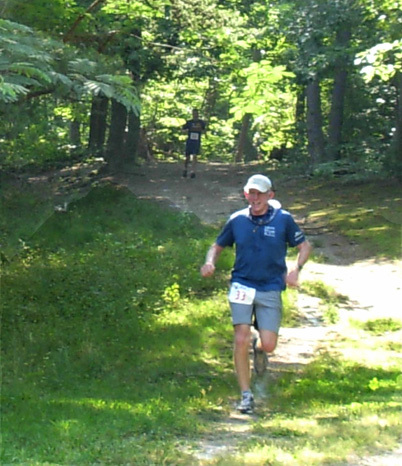 Jim kicks it in at the finish of the Trail Nut Half Marathon at Falling Creek in May. It's a slow process to get faster, however. It worked well when we were in our 30s -- why not now?? 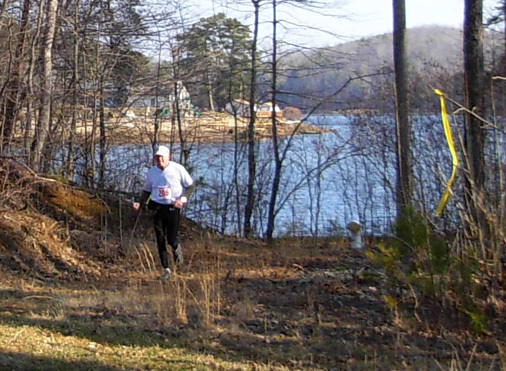 Jim was in the back of the pack at Horton's Holiday Lake 50K+ race in February, placing 232nd out of 233 official finishers within the 7�-hour time limit. Hey -- second to DFL is better than a DNF! He came in with only 58 seconds to spare, making for an exciting finish. 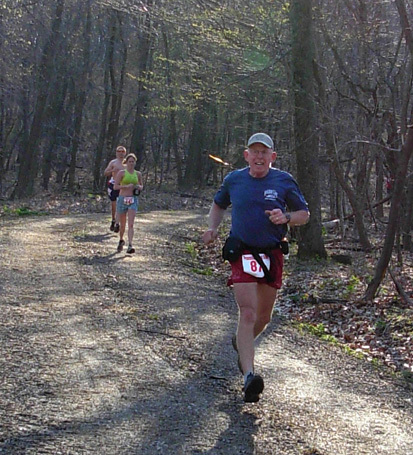 He improved his overall standing in April at the more mountainous (and longer) Promise Land 50K. Although his pace was slower due to the terrain, he tied a runner 23 years his junior for 206th place out of 258 official finishers. It was his second-fastest of three finishes in the race. He felt good after both those ultras and didn't require much time to recover. His times are also improving in the shorter races he ran in April and May and he's placed well in his age group (M55-59) even though he is at the high end of it. He'll move into the 60-64 age group August 1. 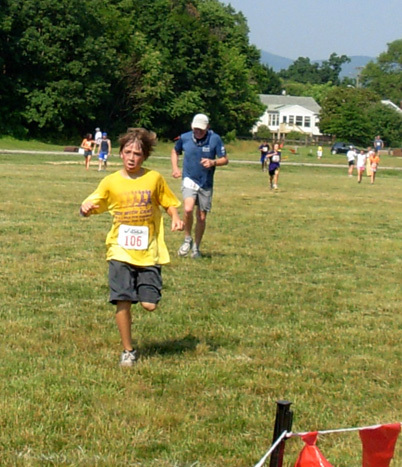 He ran "grace"fully through the woods and over the grass at the Run With Grace 5K trail race yesterday . . .
That was fun to watch, too! Jim's a good sport. He thought it was amusing and congratulated the kid in the finish chute for his race savvy. 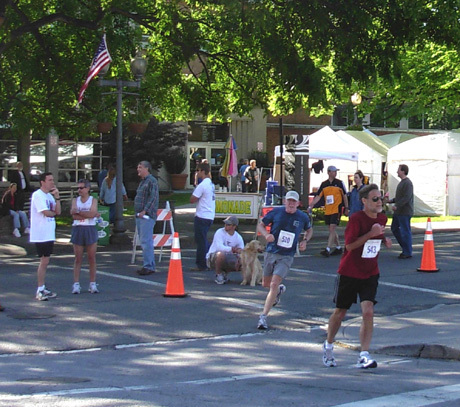 Jim talked me into running a 5K road race, a 5K trail race, and a 10K trail race recently. I can't even remember the last time I ran such short races! We weren't familiar with any of the courses and they turned out to be hillier than I was trained for. I swallowed my pride and walked where I had to, just as I would in an ultra. Because there wasn't that much competition in the F55-59 age group, I won an award at all three races. Jim ran faster than I did but didn't place in the top three in his age group in all of his races -- he teases me about that. I counter with the age thing. Pretty soon he'll be in a new age category and will have better odds of collecting race hardware. There are more men than women our age and older who run all distances, including ultras, so Jim will almost always have more competition than I do in races. What was that I said at the beginning of the year about just outliving the competition?? at the end of the Promise Land 50K. It's fun when we can tie or beat younger folks! We have a lot more work to do to gain the speed we want. You'd think that a couple of old(er) fogies with CRS Syndrome wouldn't remember how fast they used to run races 25 years ago, but you'd be wrong. Unfortunately, we remember our PRs with crystal clarity (to the second!) and that causes us some frustration. We're wise enough to set new goals that are reasonable for our age; we haven't reached them yet, but we're trying almost as hard as we used to. Jim hasn't had time for much cross-training this year but will probably incorporate more weight work, walking, and perhaps cycling into his schedule after his EMT class ends. Most of my cross-training is similar to last year -- walking on rest days, working out on weight machines about three times a week at the YMCA, daily stretching and some yoga at home, and massage and chiropractic adjustments as needed. One new twist I've added is resuming some bike riding, both road and off-road. I never have reviewed the book I mentioned in the 2008 intro, have I? Oops. Younger Next Year is the title. I've been trying to live by its two athletic principles, though -- at least 45 minutes of aerobic exercise a day, plus weight work. I'll eventually expound on this in another entry. Now that it's in the 90s with matching humidity, it's about time for us to increase our mileage for Hinson Lake at the end of September . . . it's brutal out there! Great timing, eh? Hopefully we'll have more seasonal temperatures soon (low 80s). Remind me to never, ever check the internet this summer to see what the afternoon temperatures are doing in Sheridan, Silverton, or Leadville. Next entry: the next phase -- our training and travel plans for races this fall and winter.